TN BOX OFFICE: HOW DID THOONGAVANAM FARE ON DIWALI DAY? 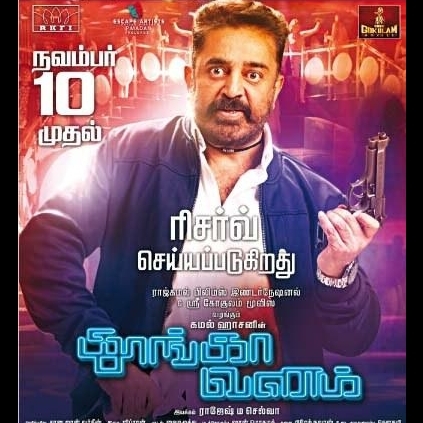 The latest Kamal Haasan starrer Thoongavanam co-starring Trisha and Prakash Raj and directed by Rajesh M Selva released alongside Ajith Kumar's Vedalam yesterday, November 10, for Diwali. The film was distributed across Tamil Nadu by Escape Artistes Motion Pictures and we hear that the first day gross of the film in TN is around the 4 crores mark. The film was censored with a U/A and it would be taxed. With a long weekend ahead, Thoongavanam can make it count particularly with the multiplex audiences on the back of some positive reviews. The hot and happening brand will have 3 this month? People looking for online information on Thoongavanam, Thoongavanam box office collections, Thoongavanam Day 1 gross will find this news story useful.